Matthew Apgar - mapgar@shawmedia.com Colten Cashmore, right, gets a hug from his second grade teacher Candace Tufo during a celebration of his 170 pound state wrestling championship at Alden-Hebron High School on Monday, Feb. 22, 2016 in Hebron. Cashmore is the school's first wrestling state champion and their first state champion for any sport since 1952. 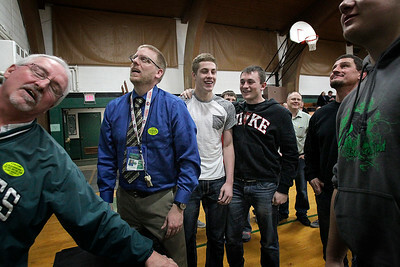 Matthew Apgar - mapgar@shawmedia.com Mixed reactions are felt as the wrestling champions board is unveiled, showing the name of 170 pound state champion Colten Cashmore, center, spelled incorrectly during a celebration at Alden-Hebron High School on Monday, Feb. 22, 2016 in Hebron. Cashmore is the school's first wrestling state champion and their first state champion for any sport since 1952. 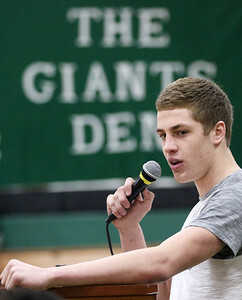 Matthew Apgar - mapgar@shawmedia.com 170 pound wrestling state champion Colten Cashmore speaks to attendees during a celebration at Alden-Hebron High School on Monday, Feb. 22, 2016 in Hebron. Cashmore is the school's first wrestling state champion and their first state champion for any sport since 1952. 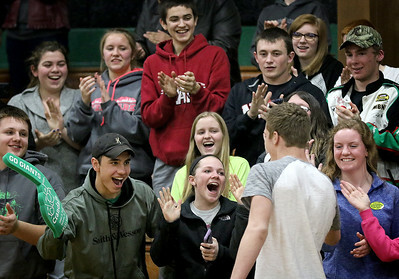 Matthew Apgar - mapgar@shawmedia.com The student body erupts in celebration as 170 pound wrestling state champion Colten Cashmore walks into the gym amidst high-fives and celebration at Alden-Hebron High School on Monday, Feb. 22, 2016 in Hebron. Cashmore is the school's first wrestling state champion and their first state champion for any sport since 1952. 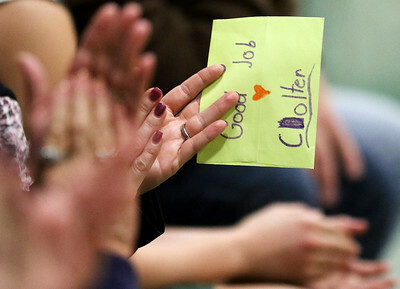 Matthew Apgar - mapgar@shawmedia.com Beth Epstein, aunt of 170 pound wrestling state champion Colten Cashmore, holds a handmade card by her daughter Morgan, 9, both of Crystal Lake, during a celebration at Alden-Hebron High School on Monday, Feb. 22, 2016 in Hebron. Cashmore is the school's first wrestling state champion and their first state champion for any sport since 1952. Matthew Apgar - mapgar@shawmedia.com The wrestling champions board is unveiled during a celebration at Alden-Hebron High School on Monday, Feb. 22, 2016 in Hebron. Cashmore is the school's first wrestling state champion and their first state champion for any sport since 1952. Matthew Apgar - mapgar@shawmedia.com Jan Winkelman cuts cakes for 170 pound wrestling state champion Colten Cashmore during a celebration at Alden-Hebron High School on Monday, Feb. 22, 2016 in Hebron. Cashmore is the school's first wrestling state champion and their first state champion for any sport since 1952. 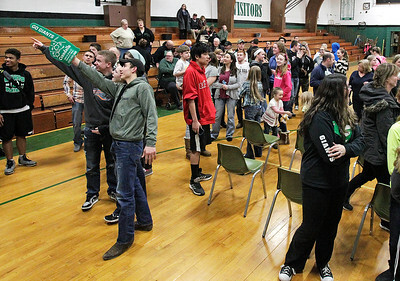 Matthew Apgar - mapgar@shawmedia.com Friends, fans, and family pack the gym during a celebration for 170 pound wrestling state champion Colten Cashmore at Alden-Hebron High School on Monday, Feb. 22, 2016 in Hebron. Cashmore is the school's first wrestling state champion and their first state champion for any sport since 1952. Matthew Apgar - mapgar@shawmedia.com Colten Cashmore, center, talks with friends during a celebration of his 170 pound wrestling state championship at Alden-Hebron High School on Monday, Feb. 22, 2016 in Hebron. Cashmore is the school's first wrestling state champion and their first state champion for any sport since 1952. 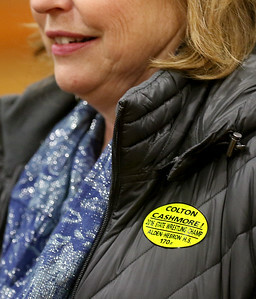 Matthew Apgar - mapgar@shawmedia.com Cindy Meyer wears a sticker handed out to attendees celebrating Colten Cashmore's 170 pound wrestling state championship during a celebration at Alden-Hebron High School on Monday, Feb. 22, 2016 in Hebron. 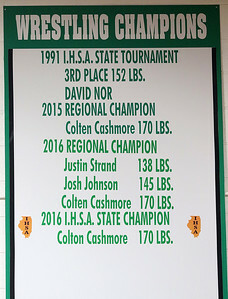 Although his name is spelled incorrectly on the stickers and on the unveiled wrestling champions board hanging in the gymnasium, Colten Cashmore is the school's first wrestling state champion and their first state champion for any sport since 1952. 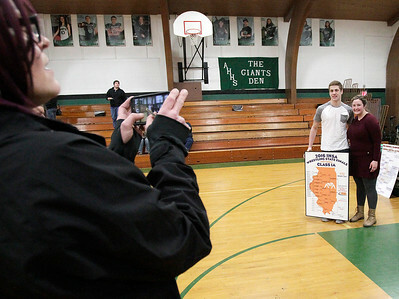 Matthew Apgar - mapgar@shawmedia.com Kelly Cashmore of McHenry, left, takes a photo of her nephew, 170 pound wrestling state champion Colten Cashmore, posing with his cousin Clara Rakoncay of Woodstock during a celebration at Alden-Hebron High School on Monday, Feb. 22, 2016 in Hebron. Cashmore is the school's first wrestling state champion and their first state champion for any sport since 1952. Matthew Apgar - mapgar@shawmedia.com Colten Cashmore, left, talks with friends in the gymnasium during a celebration of his 170 pound state wrestling championship at Alden-Hebron High School on Monday, Feb. 22, 2016 in Hebron. Cashmore is the school's first wrestling state champion and their first state champion for any sport since 1952. Colten Cashmore, left, talks with friends in the gymnasium during a celebration of his 170 pound state wrestling championship at Alden-Hebron High School on Monday, Feb. 22, 2016 in Hebron. Cashmore is the school's first wrestling state champion and their first state champion for any sport since 1952.